the first time i saw bread being made in a food processor, in under 2 minutes, i didn’t know whether to be amazed or aghast but after speaking to fabrizio bottero of cuisinart, i learned just why it works so well. the gluten strands which develop and are then cut by the whirring blades during processing reconnect as soon as the processing stops. this is an important lesson about bread dough. think of dividing the dough as you would about the human body as in a break vs. a sprain. a break heals, a sprain is a tear that weakens a ligament and never repairs in the same way. this means that to have a strong viable dough you can cut it with sharp shears or a knife but not pull it apart to tear it! the potential problem with the food processor, however, is that the friction produced by the blades can overheat the dough very easily and also the processor can stall if the dough is stiff or if there's a large quantity of it. charlie vanover solved the second problem by working with cuisinart to design a machine that has a dough button that actually slows the machine preventing overheating and straining of the motor. if you are using another type of processor, it may be necessary to stop when you hear the motor straining or the dough jamming and allow it to rest for a few minutes for before continuing. for the second problem—overheating—i have come up with the following solution: i have everything but the butter as cold as possible to prevent build up of heat in the processor. If the butter has not been softened, however, the processor is likely to stall. freezing the flour/sugar/yeast mixture for 15 minutes or as long as you want would only help but is not absolutely necessary. one of my favorite recipes in the bread bible is for the ricotta loaf on page 285 but i'm about to provide you with a better version of it—so much better in fact that i originally called it "ricotta bliss bread." here's another lesson: bread baked free form as opposed to in a loaf pan will be more open in texture. i can just hear the gears clicking as some of you will think—but what about the no knead bread? well if a bread is that moist, and has no side walls of a pot to restrain it, it will puddle sideways and not rise as much—as many of you have experience i'm sure. 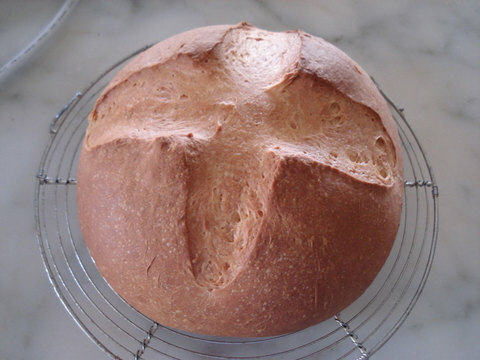 the bliss bread which makes two loaves became the ricotta loaf due to the organization of the book. the texture was not that of a rustic bread but rather that of a soft loaf so it fell into the loaf category and i was asked to tweak it into loaf shape. but just last week, i decided to make it the way it was originally intended and gasped at the incredible softness and deliciousness of flavor—so extraordinary i knew i'd have to share it with you as soon as possible. for those of you who have the first and second printing of "the bread bible," just print it out and tuck it into the book. it's the same recipe, but shaping, rising, and baking times will vary. i added it to the third printing so it will be in all subsequent printings. By the way, note in the photos the difference in the top crust of the cut and uncut loaf. the cut loaf was one that hadn't been proofed as much during the final rise and therefore burst open a little unevenly on baking. the uncut loaf has wide openings because it was just ever so slightly underproofed--my preference--so it can have more oven spring and more attractive slashes. This recipe was adapted from one that came to me as a gift from Diego Mauricio Lopez G. of Pandora bakery in Columbia South America after the publication of The Cake Bible in 1988. As I was busy at the time, I put it aside and years passed before I came across it again and tried it. 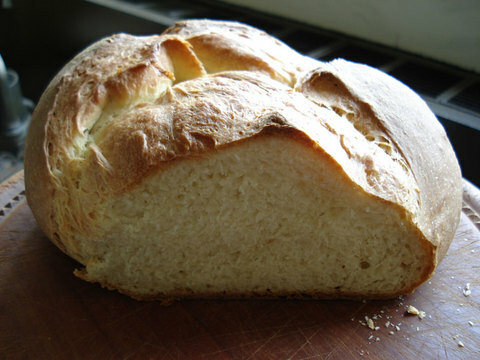 This bread is incredibly quick and easy to mix and thoroughly enjoyable. It is a pleasure just to touch the dough which is as soft as a newborn's skin. It bakes into a pale yellow almost lacy, unfathomably soft crumb that can be sliced very thin. The flavor is ethereal, rich and deeply complex. I should never have waited so long! Equipment: A baking sheet lined with parchment, or sprinkled with flour or cornmeal. A baking stone or baking sheet. If using active dry yeast proof it. To proof, dissolve it with a big pinch of the sugar in 2 tablespoons of the water warmed only to hot bath temperature, 110°F./43°C. Set it in a warm spot for 10 to 20 minutes. It should be full of bubbles. Add it when adding the ricotta. In a medium bowl, whisk together the flour, sugar, and instant yeast. Place it in a food processor with the dough blades. Add the ricotta, softened butter, egg, and salt and pulse about 15 times. With the motor running, add the cold water. Process 60 to 80 seconds but be careful not to allow the dough to get hot—i.e. not over 80°F/27°C. The dough should be soft but not sticky. If it is not soft, spray it with a little water and pulse it in. If it is sticky, transfer it to a counter and knead in a little flour at a time. After the first rise it will become firmer and difficult to shape if it is not soft. The dough will weigh about 2 pounds, 5 ounces/1048 grams. If you are baking the same day, preshape it by pulling the edges to the top. Without flipping the dough over, use a bench scraper to move each round to a lightly floured counter. Cover them with lightly oiled plastic wrap and allow them to sit for 20 minutes or until extensible (when you pull the dough gently it stretches without tearing). Mist the dough with water and quickly but gently set the baking sheet on the hot baking stone or hot baking sheet. Toss 1/2 cup of ice cubes into the pan beneath. Immediately shut the door and bake 35 to 40 minutes or until golden and a skewer inserted in the middle comes out clean (A instant read thermometer inserted into the center will read about 200°F./93°C.). Halfway through baking, turn the pan around for even baking. Transfer the loaves to a rack and brush with the melted butter if desired. Cool until barely warm—at least 1 hour. Note: If you prefer to use a mixer, proceed exactly as above, but have the water at room temperature. Use the dough hook on low speed (#2 Kitchen Aid) and gradually add the water. When the dough is moistened, raise the speed to medium low (#3) and knead for 10 minutes.